The charismatic forger immortalized in the film Catch Me If You Can exposes the astonishing tactics of today’s identity theft criminals and offers powerful strategies to thwart them based on his second career as an acclaimed fraud-fighting consultant. *Six out of ten American companies and government agencies have already been hacked. *An estimated 80 percent of birth certificate requests are fulfilled through the mail for people using only a name and a return address. So I could take your name and use my address, and get your birth certificate. From there I’m off to the races. *Americans write 39 billion checks a year, and half of these folks never reconcile their bank statements. *A Social Security number costs $49 on the black market. A driver’s license goes for $90. A birth certificate will set you back $79. When Frank Abagnale trains law enforcement officers around the country about identity theft, he asks officers for their names and addresses and nothing more. In a matter of hours he can obtain everything he would need to steal their lives: Social Security numbers, dates of birth, current salaries, checking account numbers, the names of everyone in their families, and more. This illustrates how easy it is for anyone from anywhere in the world to assume our identities and in a matter of hours devastate our lives in ways that can take years to recover from. 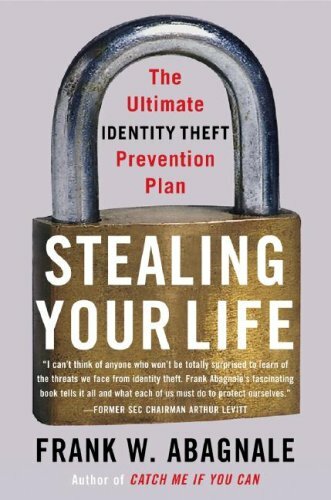 Considering that a fresh victim is hit every four seconds, Stealing Your Life is the reference everyone needs by an unsurpassed authority on the latest identity theft schemes. • Don’t allow your kids to use the computer on which you do online banking and store financial records (children are apt to download games and attachments that host damaging viruses or attract spyware). • Beware of offers that appeal to greed or fear in exchange for personal data. • Read privacy statements carefully and choose to opt out of sharing information whenever possible. Brimming with anecdotes of creative criminality that are as entertaining as they are enlightening, Stealing Your Life is the practical way to shield yourself from one of today’s most nefarious and common crimes. If you have any questions about this product by Brand: Broadway Books, contact us by completing and submitting the form below. If you are looking for a specif part number, please include it with your message.